Ships today if you order in the next 11 hours 26 minutes. Get a complete digestive formula that helps you get the most out of your meals while promoting comfortable, reliable elimination. It's not uncommon to have digestion problems. Some people have issues with certain kinds of food, other complications can come from stress. Whatever the case, Digest Basic + Probiotics from Enzymedica may be able to help you out. It gives you potent enzymes along with eight strains of probiotics. But even with all that power - it's also a gentle formula that can enhance digestion of all major food groups. Plus, it improves nutrient absorption while decreasing uncomfortable symptoms like occasional gas and bloating. Enzymes help your body break down the food you eat, making important nutrients easier to absorb in your digestive system. Your body produces its own enzymes, and we can also get them from natural, unprocessed foods. Low enzyme activity can lead to digestive issues and may require extra support. Supplementing with enzymes could help. This selection uses Enzymedica's very own Thera-blend process - combining the enzymes protease, lipase, amylase and cellulase. Together, these enzymes form a team that has the potential to break down more fats, proteins and carbohydrates than any single-enzyme product. Enzymes form an important partnership with probiotics to reduce stress throughout the gastrointestinal tract. As the enzymes help with digestion, probiotics take advantage of the healthy environment in your intestines. Probiotics support intestinal microflora, which promote regularity, immune system strength, production of vitamins B and K and more. This product includes 8 beneficial strains of living organisms including Lactobacillus Acidophilus DDS-1, which could help people with difficulty digesting food containing lactose. Get your digestive tract in top shape and discover relief. 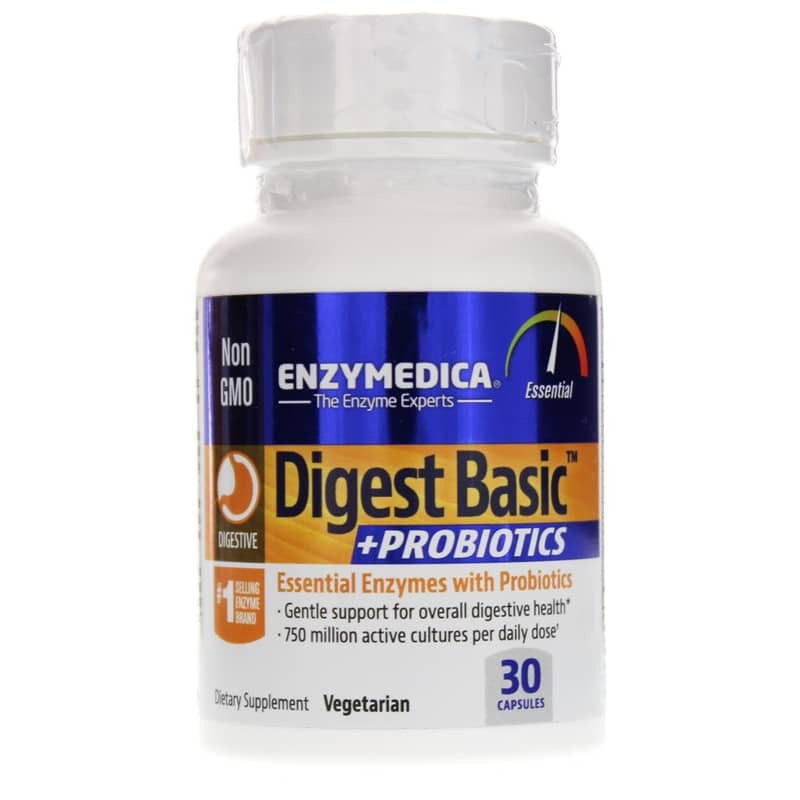 Order Digest Basic +PROBIOTICS from Enzymedica today! 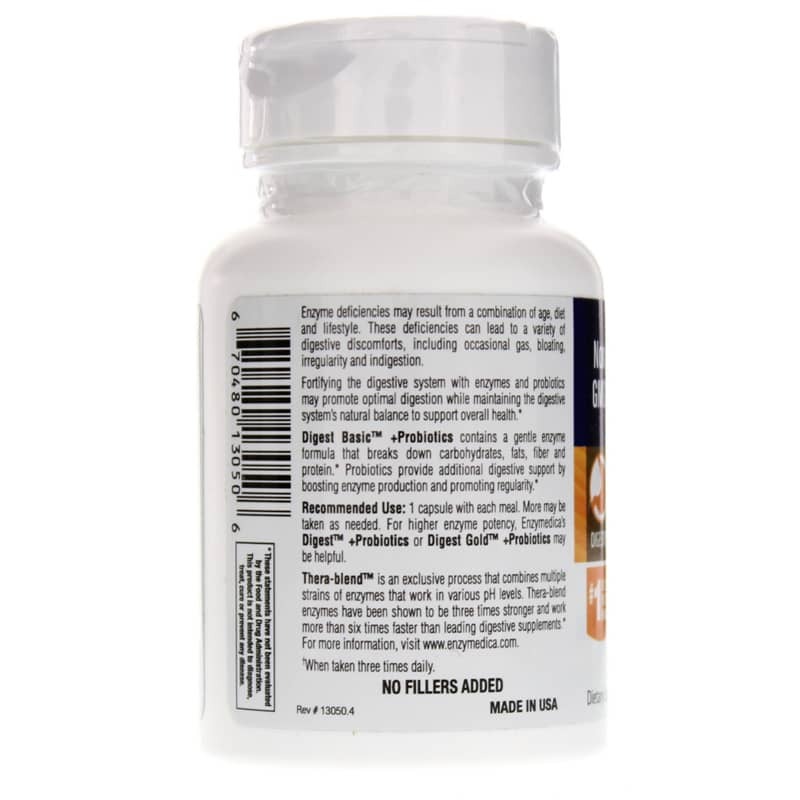 Adults: Take 1 capsule with each meal for enhanced digestion. 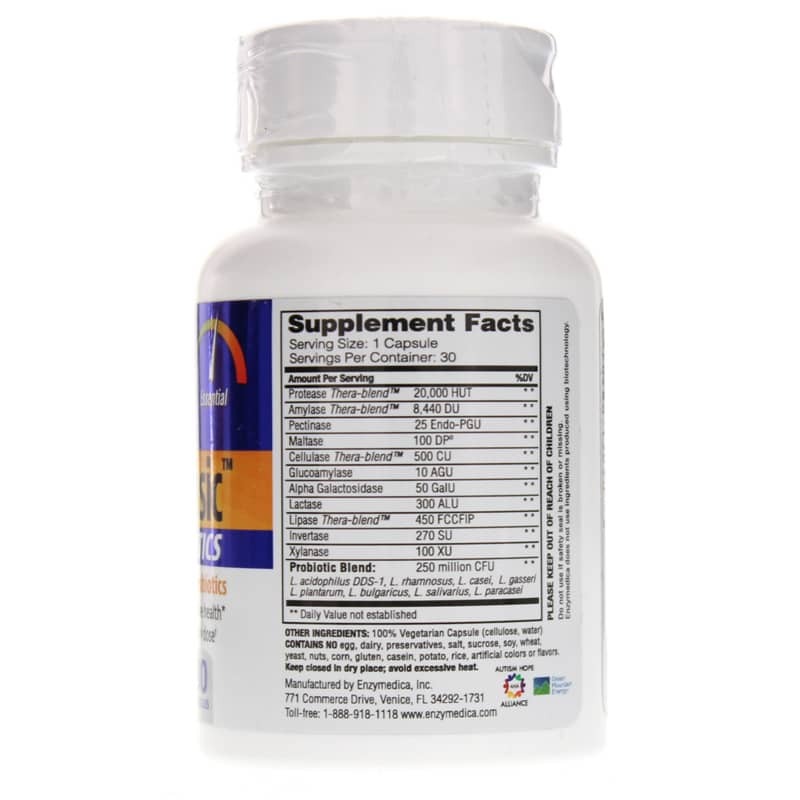 When taken 3 times daily, an individual receives 750 Million CFUs of beneficial probiotics. This product (and the brand line) was recommended to me by a friend. I am glad she shared this with me. Digest Basic helps my body digest the foods that it struggles to digest on its own, and that is a big help. I am able to eat things now that, without the help of this supplement, I would have been forced to leave out of my diet (e.g. I can eat beans, gluten-free grains, oatmeal, corn, etc.). Having this supplement handy (along with rest) always helps.